love all of these prizes! yay!!! Just dropping in to let you know that Sophie Stockwell won the election ! We’ll see if she upholds her campaign promises ! Ooh, those jammies! I would love a pair for myself! Do we know if there will be another monthly deluxe box room collection theme, like Cozy Condo, and It’s Fun To Be Young? Yay! I was hoping Sophie or PJ would win! yay! Golden State is playing in Atlanta, and I’m not there – such a bummer! moms … sorry you didn’t get to the game… Looked up the score this morning..
Back to work today………..but looking forward to having a couple of weeks off for Christmas soon !! Maybe the Snowy Retriever is possible after all… but really time consuming ! especially with upcoming Miss Birdy giveaway…. Love the Christmas torque hat ! Crackers due out tomorrow !! agreed, the Birdy prizes are all sweet gifts! dee, I started decorating yesterday. didn’t do alot last year because not knowing how I would be after surgery, with visions of it being Easter before I’d get Christmas packed up. trying to make up for it this year, tho’ I really should have started after Halloween. We gave them our computer room as a bedroom. Thankfully my son just got a new laptop for school so now I can borrow it once in a while. Life with 2 extra kids sure is stressful lol. I love the prizes that being given away this year!! 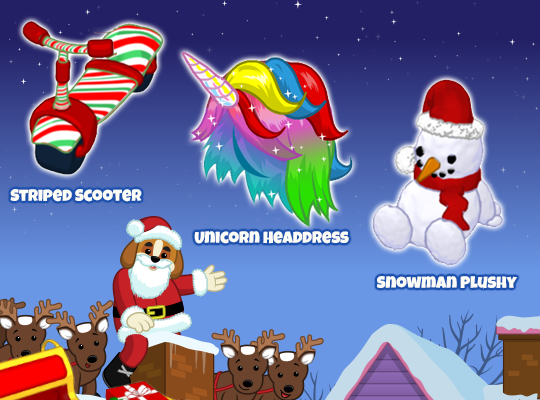 I am excited for Webkinz Christmas!! I hope everyone is doing well. I really miss you guys!! no tree here yet…….i wrapped some presents…….three dd had picked out when she was here at turkey day so……..
nita – wow! you are an angel to those kiddos, but i’ll bet your noise level and busy level just went through the roof! Popping in to say hi! It’s a busy time of the year! We may get our Christmas tree this weekend. We have company coming in on Friday through next Wed. (A girl friend of my dd’s. They sang in choir together, but her friend has moved on). My dd’s concert is Sat. night. I managed to get all the floaties in WW for Tuesday, but forgot all about the woolly piglet on WKN. I was able to get three before midnight, but they aren’t floating freely now! Sigh! I’ll have to go to bed and try later! A very early morning to you, Gymbonians! Or a very late evening. Whatever your preference. Oh yay. Bernie Stockwell won, woo hoo. It proves what I said…people always vote for free stuff, lol. I sure hope that I don’t get stuck with a bunch of estore junk I don’t want on my main account, because I am ultra-picky with that account. I voted for Dex, because I wanted the Spree rolls back that we lost when Cowabelle became mayor. I was willing to trade the Spree rolls for the ability to put what I want where I want it, but it would have been nice to have them back. Oh well! My candidate never wins, so my luck is running as per usual. Extra bonus things I got in the crackers. Of course I already had them all, but there’s some extras for trading, which is always nice! One thing that really ticked me off…I opened a cracker on my main account, and I got a Sugar Plum Ballerina Dress and a Green Mushroom Chair from the goblin event. WHAT?!?! The Sugar Plum Ballerina Dress is oooooold, and I already have it, and why the heck is a common piece of furniture in a clothing-only cracker?! And no new clothing in that cracker?! The estore is getting a phone call from me in the morning, because that is NOT right. I’m wondering what I was SUPPOSED to get instead of a Green Mushroom Chair, grrr. I made sure to take a screenshot in case they give me any trouble. If anybody else gets crackers, I hope you get what you want in them! And I hope nobody else gets stuck with a Green Mushroom Chair. Oh, I forgot to mention: the Snow Globe Gown is ANIMATED!!! I expect this to be exceedingly hard to trade for because it is animated. Good luck to all! Lurker… Congrats on all of the goodies you received from the crackers ! Nita… Nice to see you ! Sounds like you have been very busy with two new additions to your family.. You are amazing for providing the kiddos with a home with lots of love ! Have not started decorating yet… although keep my Santa collection out all year round ! Makes me happy ! TLL – thanks for giving us that info! i can’t believe you got a mushroom chair – that’s a big programming fail! i would definitely ask for a replacement cracker! sorry about the estore stuff & getting “extra” unwanted items – maybe you can convince her to run for reelection on the platform of being able to send all estore items! the snow globe gown sounds spectacular!!! and congrats on the buddy – i think that is the cutest one so far! QoS – i hope you enjoy your company this weekend! Dee, are you on WI? You two are making me extremely curious. Y’all reminded me I forgot my un and password for WI but now their captcha verification is down so I can’t fix it. I got the trophy distance on leaping llama twice today before I realized I already owned the trophy and it not giving me one wasn’t a glitch lol. I am officially on winter break, however I still can’t relax without my last grade. the point balance was made so that you pass or fail based on the final paper/s. I find that to be the most annoying thing in the world. This after I had to fix a registration block because their instructions were not clear in the slightest for academic plans. Luckily I got it fixed before all the seats in the classes I wanted were taken. Bepsy… Happy for you that you are officially on break !! You have worked hard and deserve it ! Enjoy ! Dixiecup… I am curious too ! Wonder what is going on ! Lurker… Congrats on getting the Snow Globe Dress ! It is really cute ! Hope you all are catching the flying Medallions… seem to be flying with a pattern… and hopefully the Snowy Retriever is obtainable !! Hope you all have a great day…. ? winter snow arriving in time for rush hour tonight ! We had a lovely snow yesterday, and it’s still here as our temps are low. The weather folk had been iffy anny about us getting snow where we are, so I was doing happy snow dance watching it fall while working on decorating. AAAAND, it’s cold enough snow is still here this morning! I love snow! Thanks for the updates, Loop! Your picture guide is up-to-date and complete as usual! I love those cute slippers. Trying to keep up with the demands of the run up to Christmas. Got my tree up, and things rearranged, but not doing so good on the shopping. I think I have joined the cyber shoppers in full force this year, because there just isn’t a lot of time to get out. So nice to click a button and have it show up on your doorstop! Now I have to remember what I’ve already ordered. I had so much fun reorganizing my whole house with the room changer! FINALLY! My Christmas rooms are all together, and I can find things again. I’ve been finding homes for all the items and food people have sent me off my wish list. Thank you, everyone! I love catching the medallions! I think getting to 100 will not be so bad, in fact, we might get enough to do some exchanges for other pets. Yay! Dee, I sent you an email. sorry i missed that last night! thanks dee for emailing me this morning – that’s when i first saw it! and thanks dixiecup for the info!! !